51oz French press coffee makers are about the largest size of a French press you can find. They are perfect for people in a large family, in an office, or for people who like to drink a large amount of coffee throughout the day. Frequently these huge french presses as labeled between 48-54oz in size but they are all usually marketed as 12-cup french press coffee makers. 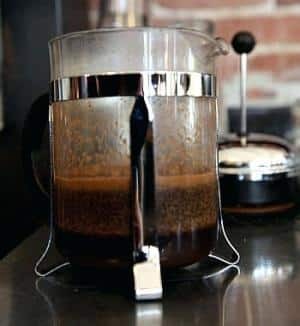 Here at Gathering grounds we make large batches of french press coffee from time to time and we have used the Bodum Columbia thermal cafetiere with great success. As always we categorically advise our customers to brew french press coffee in an insulated press pot because they have stable temperatures through the brewing process. I know you are looking to buy an affordable French press that is as big as they get so take a look at the pots we’ve featured below. If you want quality go for a thermal model. If you are more price sensitive we suggest choosing a standard glass one french press that will come with either a plastic or stainless steel frame. If you need an insulated French press, check out the stainless steel options as many of them provide high heat retention. Bodum Chambord 12 cup French Press Coffee Maker, 51 oz, ChromeThis is one of the best selling coffee presses by far! It also gets some of the highest reviews of all the various competitors so it’s definitely a great option. the entire plunger can be disassembled easily for deep cleaning. The reason it is so popular though is probably it’s price relative to it’s build quality. You just can’t beat the price! 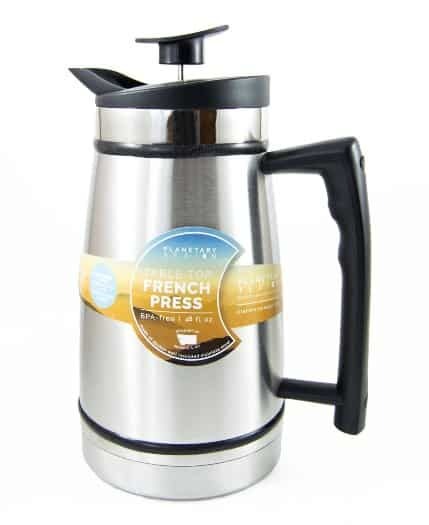 Planetary Design Table Top Stainless Steel French Presses 48oz Brushed StainlessThis french press is simply better than the Chambord featured above and it’s priced a bit higher to reflect that. You will get a much cleaner cup of coffee here because the filter screen is an ultra-fine mesh that does a better job at keeping solids out. We also greatly prefer insulated coffee presses because they result in better extraction through more stable temperature control. Bodum Columbia Thermal 51-Ounce Stainless-Steel Coffee PressAround here we use a big Bodum Columbia thermal french press more than any other. The build quality is excellent and the thermal insulation can’t be beat by much if at all. 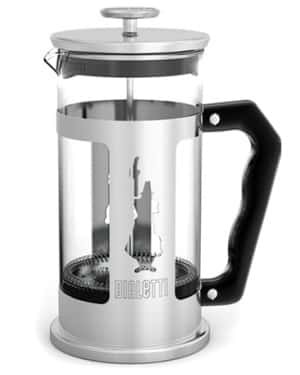 This french press looks more like an insulated carafe and it’s tiny bit bigger than the model from Plaetary Designs featured above. The pricing is still good though and we still advise our customers to go for this one most of the time. BonJour French Press Monet, Polished Stainless Steel, 12-CupThis 12-cup BonJour french press is easy to clean! It’s very similar to the Bodum Chambord and it’s priced higher but we think it’s a good value anyway due to the ease of cleaning and the fact that the carafe can be removed and replaced from the stainless steel frame for whatever reason. 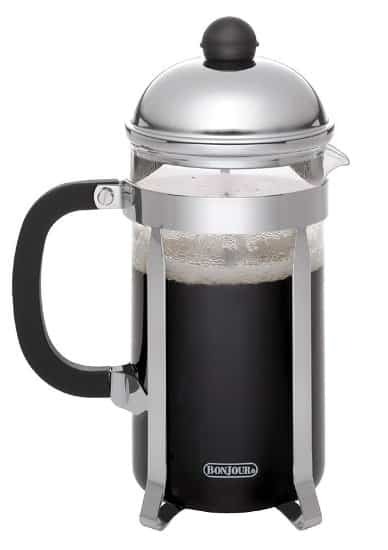 Our 51oz French press coffee makers range in price from $30.00 to $155.00. 51oz French press options come with a handle and a detachable, plunging top, which make for easy holding and pouring. This feature also allows for fast and efficient washing. French press coffee makers maintain the handle at a regulated temperature so you won’t burn yourself when pouring. All options come with a built-in, 3-piece filtering system, which means – no paper filter. For the material, you can select from glass, stainless or brushed steel, or BPA-free plastic. Glass: glass provides transparency so you can see how much coffee you have, and it makes cleaning up easier. 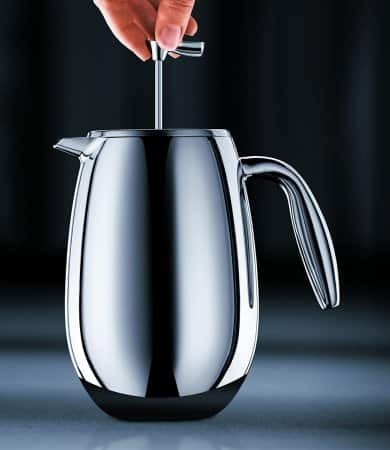 Glass is more likely to shatter than stainless steel or plastic, but they are heat resistant so you can pour extremely hot water in the carafe for coffee brewing. Stainless or brushed steel: stainless steel or brushed steel provide better insulation (keeping beverages hot or cold longer) than other materials, and does not stain as easily. However, many of these coffee makers require hand washing, so please check the product description if you prefer it to be dishwasher safe. Each 51oz French press offers about 12 cups of 4oz of coffee, or 5 to 6 mugs. Just remember to use coarsely ground coffee when brewing with a French Press. Some even come with a measuring scoop to measure your coffee. 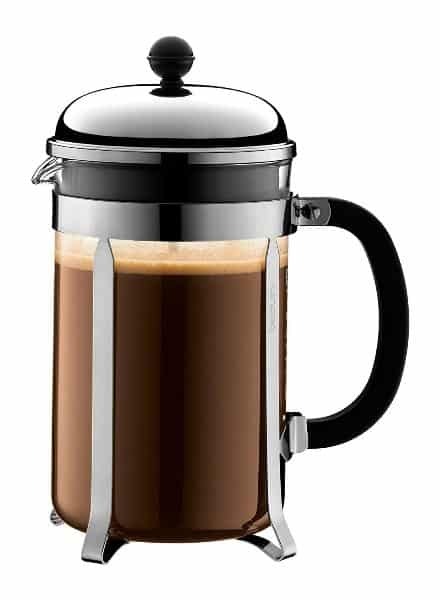 If you’re looking for a large French press but are not sure what size you want, we have a page dedicated to various large sizes of French press coffee makers. If you still want a French press, but don’t need something quite so large, we have a selection of many other sizes available on our coffee makers page. I would also like to encourage you to read more about how to make better coffee in a french press. Our french press water to coffee ratio can be found here and the instructions include the reasoning behind our tendency to recommend insulated cafetieres over standard glass models. Note – These types of french presses are sometimes labeled 12-cup french press pots. Some brands don’t go quite this big in size although there are still full sized coffee presses.